The federal government shut down for 519 minutes in Friday’s early morning hours. The shutdown came despite leaders of both parties agreeing to a large funding deal before the deadline. Blink and you may have missed it: The US federal government did, in fact, enter into a partial shutdown in the wee hours of Friday morning – and lawmakers are still shaking their heads at how they got to that point. The entire ordeal was wrapped up in 519 minutes with a signature from President Donald Trump. But to members of Congress, the late night was very avoidable. Days ahead of the deadline, Senate leaders from both parties rolled out a massive budget deal to set funding levels over the next two years. The deal included short-term funding to hash out details of the two-year budget, funding for areas hit by natural disasters, and more. The deal was negotiated with House leadership as well, making the resulting package nearly as bipartisan as possible. Support for the bill came from all corners, with members from across the aisle and around the Capitol expressing support. But snags in both chambers of Congress held up the deal and resulted in the 19th shutdown since the modern budget process was adopted in 1974. The direct cause of the delay can be pinned on one senator: Rand Paul. Paul staged a protest due to complain about the federal budget deficit, blocking a procedural Senate vote that would have allowed a vote as early as 7 p.m. ET. By doing so, Paul forced the chamber to wait until early Friday – after the shutdown deadline – to officially pass the bipartisan deal by an overwhelming margin. Lawmakers of both chambers and parties were not happy with Paul’s choice. 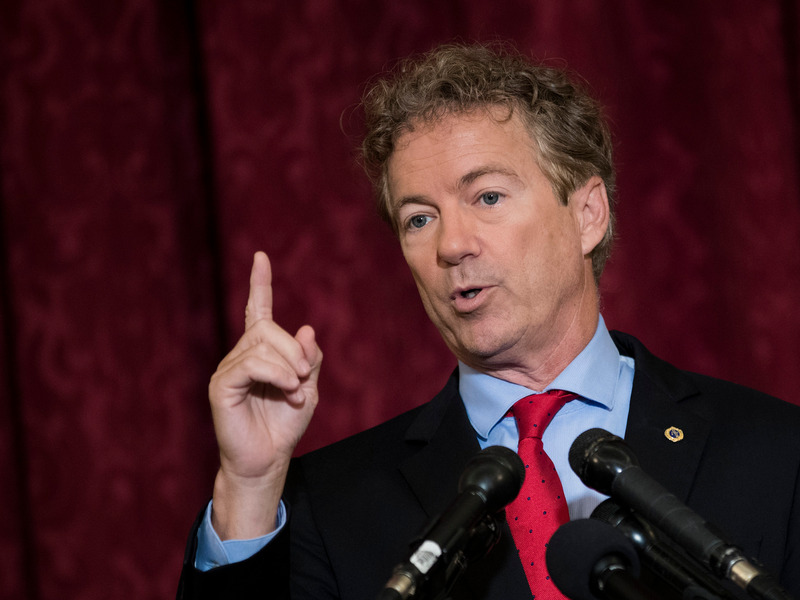 Republican senators blasted Paul’s delay tactics on the Senate floor, often speaking directly to the Kentucky lawmaker’s face. “I think people understand this is the act of a single senator who is just trying to make a point but doesn’t really care too much about who he inconveniences,” said Sen. John Cornyn, the second-ranking Senate Republican. Despite some opposition, there was little question that the bill would eventually pass the Senate, making Democrats annoyed as well by Paul’s delay tactics. “This is the dumbest shutdown ever,” Sen. Brian Schatz of Hawaii tweeted. Senate staff members were also displeased as the protest dragged on late into the night. Rep. Charlie Dent, a moderate Republican who is retiring at the end of the year, even went to far as to make reference to an alleged assault Paul has said came at the hands of his neighbour. “When Rand Paul pulls a stunt like this, it easy to understand why it’s difficult to be Rand Paul’s next door neighbour,” Dent told reporters. In the House, meanwhile, a sizable amount of Republicans said they would not vote for the increase in non-defence spending, meaning GOP leaders needed some Democrats’ votes to pass the bill. Democratic leadership gently urged members to vote against the package because it did not include a codification of the Deferred Action for Childhood Arrivals immigration program, throwing into question whether the bill had the necessary support. But many moderate Democrats were on board with the deal because it secured significant increases in funding for domestic programs and other priorities. This led to a fractured conference and added a bit of drama to the final House vote. In the end, 73 Democrats voted yes, while 67 Republican crossed party lines and vote against the package. Rep. Patrick McHenry, the House GOP’s deputy whip, said the early-morning drama and Democratic infighting was the result of a bad strategy and only served to add tension to an already bizarre shutdown.